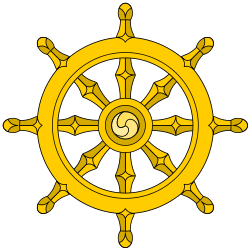 In Buddhism, it is the last of the eight elements of the Noble Eightfold Path. [web 2] In the Ashtanga Yoga tradition, it is the eighth and final limb identified in the Yoga Sūtras of Patañjali. The term 'Samadhi' derives from the root sam-a-dha, which means 'to collect' or 'bring together', and thus it is often translated as 'concentration' or 'unification of mind'. In the early Buddhist texts, samadhi is also associated with the term samatha (calm abiding). In the suttas, samadhi is defined as one-pointedness of mind (Cittass'ekaggatā). Buddhagosa defines samadhi as "the centering of consciousness and consciousness concomitants evenly and rightly on a single object...the state in virtue of which consciousness and its concomitants remain evenly and rightly on a single object, undistracted and unscattered" (Vism.84-85; PP.85). Access concentration (upacarasamadhi): Arises when the five hindrances are suppressed, when jhana is present, and with the appearance the 'counterpart sign' (patibhaganimitta). Samādhi is the last of the eight elements of the Noble Eightfold Path. [web 2] The Noble Eightfold Path is a condensation of more elaborate descriptions of this path, which starts with a householder who hears the dhamma and leaves home, and after preparatory practices starts with the practice of dhyana. [note 2] Samādhi refers here to the jhanas, levels of gradual deepening of meditation. The Pāli canon describes eight progressive states of jhāna: four meditations of form (rūpa jhāna), and four formless meditations (arūpa jhāna). 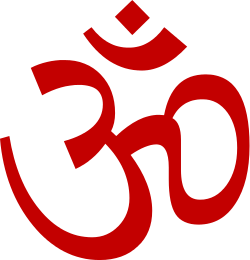 A ninth form is Nirodha-Samāpatti. "Suppose that a wild deer is living in a wilderness glen. Carefree it walks, carefree it stands, carefree it sits, carefree it lies down. Why is that? Because it has gone beyond the hunter's range. [note 4] In the same way, a monk—quite withdrawn from sensual pleasures, withdrawn from unskillful qualities—enters & remains in the first jhana: rapture & pleasure born from withdrawal, accompanied by directed thought & evaluation. This monk is said to have blinded Mara. Trackless, he has destroyed Mara's vision and has become invisible to the Evil One. "Then again the monk, with the stilling of directed thoughts & evaluations, enters & remains in the second jhana: rapture & pleasure born of composure, unification of awareness free from directed thought & evaluation—internal assurance. This monk is said to have blinded Mara. Trackless, he has destroyed Mara's vision and has become invisible to the Evil One. "Then again the monk, with the fading of rapture, he remains equanimous, mindful, & alert, and senses pleasure with the body. He enters & remains in the third jhana, of which the Noble Ones declare, 'Equanimous & mindful, he has a pleasant abiding.' This monk is said to have blinded Mara. Trackless, he has destroyed Mara's vision and has become invisible to the Evil One. "Then again the monk, with the abandoning of pleasure & stress—as with the earlier disappearance of elation & distress—enters & remains in the fourth jhana: purity of equanimity & mindfulness, neither-pleasure-nor-pain. This monk is said to have blinded Mara. Trackless, he has destroyed Mara's vision and has become invisible to the Evil One. "Then again the monk, with the complete transcending of perceptions of [physical] form, with the disappearance of perceptions of resistance, and not heeding perceptions of diversity, [perceiving,] 'Infinite space,' enters & remains in the dimension of the infinitude of space. This monk is said to have blinded Mara. Trackless, he has destroyed Mara's vision and has become invisible to the Evil One. "Then again the monk, with the complete transcending of the dimension of the infinitude of space, [perceiving,] 'Infinite consciousness,' enters & remains in the dimension of the infinitude of consciousness. This monk is said to have blinded Mara. Trackless, he has destroyed Mara's vision and has become invisible to the Evil One. "Then again the monk, with the complete transcending of the dimension of the infinitude of consciousness, [perceiving,] 'There is nothing,' enters & remains in the dimension of nothingness. This monk is said to have blinded Mara. Trackless, he has destroyed Mara's vision and has become invisible to the Evil One. "Then again the monk, with the complete transcending of the dimension of nothingness, enters & remains in the dimension of neither perception nor non-perception. This monk is said to have blinded Mara. Trackless, he has destroyed Mara's vision and has become invisible to the Evil One. This problem has been elaborated by several well-known scholars, including Tilman Vetter, Johannes Bronkhorst, and Richard Gombrich. Schmithausen[note 7] notes that the mention of the four noble truths as constituting "liberating insight", which is attained after mastering the Rupa Jhanas, is a later addition to texts such as Majjhima Nikaya 36. Both Schmithausen and Bronkhorst note that the attainment of insight, which is a cognitive activity, cannot be possible in state wherein all cognitive activity has ceased. According to Vetter and Bronkhorst, dhyana itself constituted the original "liberating practice". According to Alexander Wynne, the ultimate aim of dhyana was the attainment of insight, and the application of the meditative state to the practice of mindfulness. According to Frauwallner, mindfulness was a means to prevent the arising of craving, which resulted simply from contact between the senses and their objects. According to Frauwallner, this may have been the Buddha's original idea. According to Wynne, this stress on mindfulness may have led to the intellectualism which favoured insight over the practice of dhyana. Thus the expression sato sampajāno in the third jhāna must denote a state of awareness different from the meditative absorption of the second jhāna (cetaso ekodibhāva). It suggests that the subject is doing something different from remaining in a meditative state, i.e. that he has come out of his absorption and is now once again aware of objects. The same is true of the word upek(k)hā: it does not denote an abstract 'equanimity', [but] it means to be aware of something and indifferent to it [...] The third and fourth jhāna-s, as it seems to me, describe the process of directing states of meditative absorption towards the mindful awareness of objects. According to Buddhaghosa, in his influential standard-work Visuddhimagga, samādhi is the "proximate cause" to the obtainment of wisdom. The Visuddhimagga describes 40 different objects for meditation, which are mentioned throughout the Pali canon, but explicitly enumerated in the Visuddhimagga, such as mindfulness of breathing (anapanasati) and loving kindness (metta). The earliest extant Indian Mahāyāna texts emphasize ascetic practices and forest dwelling, and absorption in states of meditative oneness. These practices seem to have occupied a central place in early Mahāyāna, also because they "may have given access to fresh revelations and inspiration." Indian dhyana was translated as chán in Chinese, and zen in Japanese. Ideologically the Zen-tradition stresses prajna and sudden insight, but in the actual practice prajna and samādhi, or sudden insight and gradual cultivation, are paired to each other. Patanjali's system is unthinkable without Buddhism. As far as its terminology goes there is much in the Yoga Sutras that reminds us of Buddhist formulations from the Pāli Canon and even more so from the Sarvāstivāda Abhidharma and from Sautrāntika." "Joy" and "I-am-ness" [...] must be regarded as accompanying phenomenaof every coginitive [ecstacy]. The explanations of the classical commentators on this point appear to be foreign to Patanjali's hierarchy of [ecstatic] states, and it seems unlikely that ananda and asmita should constitue independent levels of samādhi. Vijnana Bikshu (ca. 1550-1600) proposes a six-stage model, explicitly rejecting Vacaspati Misra's model. Vijnana Bikshu regards joy (ananda) as a state that arises when the mind passes beyond the vicara stage. Whicher agrees that ananda is not a separate stage of smadhi. According to Whicher, Patanjali's own view seems to be that nirvicara-samādhi is the highest form of cognitive ecstacy. Dhyana. Over time and with practice, the yogin learns to sustain awareness of only the pratyaya, thereby dharana transforms into dhyana. In dhyana, the yogin comes to realize the triplicity of perceiver (the yogin), perceived (the pratyaya) and the act of perceiving. The new element added to the practice of dhyana, that distinguish it from dharana is the yogin learns to minimize the perceiver element of this triplicity. In this fashion, dhyana is the gradual minimization of the perceiver, or the fusion of the observer with the observed (the pratyaya). Samādhi. When the yogin can: (1) sustain focus on the pratyaya for an extended period of time, and (2) minimize his or her self-consciousness during the practice, then dhyana transforms into samādhi. In this fashion then, the yogin becomes fused with the pratyaya. Patanjali compares this to placing a transparent jewel on a colored surface: the jewel takes on the color of the surface. Similarly, in samādhi, the consciousness of the yogin fuses with the object of thought, the pratyaya. The pratyaya is like the colored surface, and the yogin's consciousness is like the transparent jewel. Sahaja samādhi is a state in which a silent level within the subject is maintained along with (simultaneously with) the full use of the human faculties. "Night and day, they ravish and enjoy the Lord within their hearts; they are intuitively absorbed in Samādhi. ||2||" (p. 1259). ↑ In the Suttapitaka, right concentration is often referred to as having five factors, with one-pointedness (ekaggatā) not being explicitly identified as a factor of jhana attainment (see, for instance, SN 28.1-4, AN 4.41, AN 5.28). ↑ See Louis de La Vallée Poussin, Musial and Narad. Translated from the French by Gelongma Migme Chödrön and Gelong Lodrö Sangpo. ↑ theravadin.wordpress.com: "In this order, therefore, what we should understand as vipassanā is not at all a synonym for sati but rather something which grows out of the combination of all these factors especially of course the last two, samma sati and samma samādhi applied to the ruthless observation of what comes into being (yathābhūta). One could say, vipassanā is a name for the practice of sati+samādhi as applied to anicca/dukkha/anatta (i.e. generating wisdom) directed at the six-sense-process, including any mental activity." According to Gombrich, "the later tradition has falsified the jhana by classifying them as the quintessence of the concentrated, calming kind of meditation, ignoring the other - and indeed higher - element. ↑ Gomez & Silk: "This samādhi is at the same time the cognitive experience of emptiness, the attainment of the attributes of buddhahood, and the performance of a variety of practices or daily activities of a bodhisattva—including service and adoration at the feet of all buddhas. 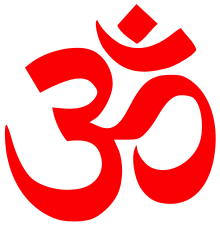 The word samādhi is also used to mean the sūtra itself. Consequently, we can speak of an equation, sūtra = samādhi = śūnyatā, underlying the text. In this sense the title Samādhirāja expresses accurately the content of the sūtra." 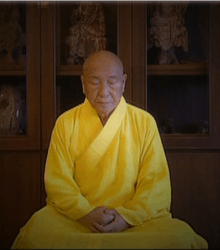 ↑ According to Jianxin Li Samprajnata Samādhi may be compared to the rupa jhanas of Buddhism. This interpretation may conflict with Gombrich and Wynne, according to whom the first and second jhana represent concentration, whereas the third and fourth jhana combine concentration with mindfulness. According to Eddie Crangle, the first jhana resembles Patnajali's Samprajnata Samādhi, which both share the application of vitarka and vicara. ↑ Yoga Sutra 1.17: "Objective samādhi (samprajnata) is associated with deliberation, reflection, bliss, and I-am-ness (asmita). ↑ Yoga Sutra 1.42: "Deliberative (savitarka) samapatti is that samādhi in which words, objects, and knowledge are commingled through conceptualization." ↑ Yoga Sutra 1.43: "When memory is purified, the mind appears to be emptied of its own nature and only the object shines forth. This is superdeliberative (nirvitaka) samapatti." ↑ Following Yoga Sutra 1.17, meditation on the sense of "I-am-ness" is also grouped, in other descriptions, as "sasmita samapatti"
↑ Yoga Sutra 1.44: "In this way, reflective (savichara) and super-reflective (nirvichara) samapatti, which are based on subtle objects, are also explained." ↑ According to Jianxin Li, Asamprajnata Samādhi may be compared to the arupa jhanas of Buddhism, and to Nirodha-Samapatti. Crangle also notes that sabija-asamprajnata samādhi resembles the four formless jhanas. According to Crangle, the fourth arupa jhana is the stage of transition to Patanjali's "consciousness without seed". 1 2 Sarbacker 2012, p. 13. ↑ Diener, Erhard & Fischer-Schreiber Ingrid 1991. ↑ Sturgess, Stephen (2014). Yoga Meditation. Oxford, UK: Watkins Publishing Limited. p. 27. ISBN 978-1-78028-644-0. 1 2 3 4 5 6 7 8 9 10 Bronkhorst 1993. ↑ Kalupahana 1994, p. 24. ↑ Crangle 1994, p. 267-274. 1 2 3 4 Vetter 1988. 1 2 3 Gombrich 1997. ↑ Bronkhorst 1993, p. 133-134. 1 2 Vetter 1988, p. xxi-xxii. ↑ Vetter & 1988 xxi-xxxvii. 1 2 Wynne 2007, p. 105. ↑ Williams 2000, p. 45. 1 2 3 4 Wynne 2007, p. 106. 1 2 Wynne 2007, p. 140, note 58. ↑ Wynne 2007, p. 106-107. ↑ Buddhaghosa & Nanamoli 1999, p. 437. ↑ Williams 2008, p. 30. ↑ Skilton 2002, p. 56. 1 2 Gomez & Silk 1989, p. 15-16. ↑ Pradhan 2015, p. 151-152. ↑ White 2014, p. 10. ↑ Werner 1994, p. 27. ↑ Thurman 1984, p. 34. ↑ Farquhar 1920, p. 132. ↑ Jones & Ryan 2006, p. 377. 1 2 Jianxin Li & year unknown. ↑ Wynne 2007, p. 106; 140, note 58. 1 2 Crangle 1984, p. 191. 1 2 3 4 5 6 Maehle 2007, p. 177. ↑ Maehle 2007, p. 156. 1 2 3 4 Whicher 1998, p. 254. 1 2 3 4 5 6 7 8 Maehle 2007, p. 179. 1 2 Maehle 2007, p. 178. ↑ Crangle 1984, p. 194. 1 2 3 Whicher 1998, p. 253. ↑ Whicher 1998, p. 253-254. 1 2 3 4 5 Forman 1999, p. 6. Sutcliffe, Steven (2004), Religion: Empirical Studies, Ashgate Publishing, Ltd.
↑ access to insight, Majjhima Nikaya 26, Ariyapariyesana Sutta, "The Noble Search"
↑ metta.lk, Majjhima Nikaya 25, Nivāpa Sutta, "The Simile of the Deer Feeder"
1 2 What is Liberation According to the Teachings of Sri Ramana Maharshi?